In Jyotish – Vedic Astrology, Rahu is the ascending lunar node. In other words, Rahu is the “The Shadowy or Un-illumined Planet”. Rahu is not visible in the heavens. In Vedic mythology, Rahu is a snake that swallows the sun causing Solar eclipse. He is depicted in art as a dragon with no body riding a chariot drawn by eight black horses. Rahu’s vehicle in a Lion. According to Vedic legend, during the Samudra manthan, the asura Rahu drank some of the divine nectar. 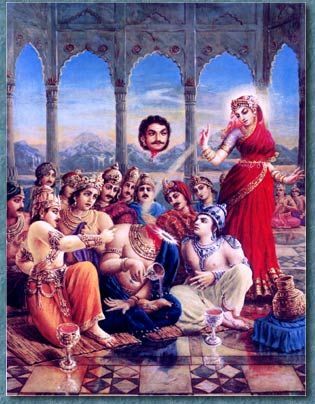 But before the nectar could pass his throat, Mohini* (the female avatar of Vishnu) cut off his head. * Mohini is one of the 25 avatars of Vishnu found in the Puranas. The main story, or lila, concerning Mohini is the Sagar or Samudra manthan, a lila that includes: Indra, Lakshmi, Kurma, Dhanvantari, and numerous other Hindu divinities. This lila details the conflict between the Daitya (demons) and the Adityas (gods), as well as their quest for amrita (nectar). In this lila, there is a time when the demons overpowered the gods and take possession of the amrita. In order to rescue the gods, Vishnu takes the form of a beautiful woman, Mohini, and approached the demons. When the demons saw the enchanting beauty of Mohini, they lost all composure. While the demons were enchanted by Her beauty, Mohini seized the nectar and distributed it amongst the gods, who drank it immediately. During this lila, Mohini also decapitates the asura Rahu. The head, however, remained immortal. It is believed that this immortal head occasionally swallows the Sun or the Moon, causing eclipses. Then, the Sun or Moon passes through the opening at the neck, ending the eclipse. The name of Rahu first appears in the Mahabharata, when we read the story of the churning of the Ocean of Milk in the search for ambrosia – the elixir of immortality known as amrita in Sanskrit. Rahu was the son of Danava Vipracitti by his wife Simhika, and a brother of Maya Danava, the great magician and architect. Rahu and Ketu are two parts of the same danava (Sanskrit for demon) and are 180° apart from each other. Whenever either Sun or Moon are conjunct with Rahu or Ketu, a solar or lunar eclipse takes place. In astronomy Rahu is considered the dragon’s head and is also known as the north node of Moon, the point where the Moon’s orbit crosses the ecliptic. Ketu is known as the dragon’s tail, which gives birth to comets and meteors and is known as the descending or the south node of the Moon. Though they are included in planets, Rahu and Ketu are not real luminaries and are regarded as shadowy planets. They do not have ability to cast aspects, as other planets do, they do not rule any zodiacal signs and are not characterized as male or female. Because they are related to Moon as its north and south nodes, they reflect the basic bipolarity of energy within the cosmos and also of the individual. They are both regarded as malefic half-planets and they bisect the natal chart of the horoscopes of all individuals. Rahu & Ketu like all other planets in Jyotish are benefic, malefic or neutral, it all depends where they are situated in one’s birth chart (janam kundali or janam patri). All planets have their positional and directional strength where they become benefic, malefic or neutral. The gemstone related to Rahu is Hessonite Garnet or Gomedh (Hindi) or Gomedhak (Sanskrit). Rahu rules number 4 in Vedic numerology.